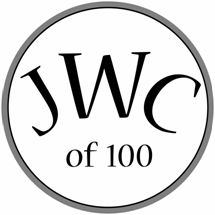 Founded in 1970, the Junior Women’s Committee of 100 is an invitation-only group of local women dedicated to supporting the Children’s Department of Emmet O’Neal Library. Each year the JWC provides hundreds of volunteer hours for the Children’s Department and puts on the Summer Kick-Off Reading Carnival and Thomas Hughes Brinkley Memorial Fun Run in May. Since 1970, the JWC has donated over $500,000 to the Children’s Department. The JWC is a tax-exempt 501(c)(3) organization. Please direct any questions regarding the JWC, including membership inquiries, to jrwc100@gmail.com. As part of your generous donation to the JWC of 100, a book will be added to the Children's collection at the Emmet O'Neal Library. A bookplate will be inscribed and a letter will be sent to the honoree. As a thank you gift, we are offering a small tote bag.